Florida's, Mike Akins is the owner of Speedster Motorcars. This is one of their Gorgeous Factory Show Cars. Check out the Custom Woodlites. Harry Floyd of Shelbill, Indiana. owns this Elegant Motors Auburn. This is his 2nd one. He wanted to make it Right... He Certainly did! Sunny California, Owner Mel Stein refers to his 876 Speedster as "The Yellow Car". Mel drives it to work at least once a week. This Month's Auburn belongs to my long time friend David Myers. Built in 1998 by the Fred Ertl Company in Dyersville, Iowa. Just for Frank Rotter, May was "Speedsters" of the Month. 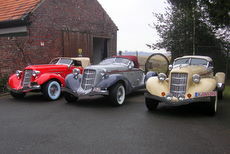 Frank lives in Germany and loves the Auburn Boattail Speedster. This Original Auburn Speedster has been displayed in The Auburn Cord Duesenberg Automobile Museum for as long as I can remember. "Doc" Sabatino's Speedster was built in Largo, Florida by Antique Automobiles of America. Custom Fender Skirts are owner designed. 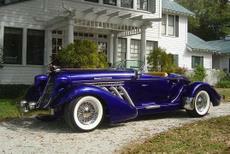 Auburn - Cord - Duesenberg - Club member, Norman Hiser from Illinois owns this very authentic looking Auburn Speedster. This Glenn Pray built Auburn belongs to ACD Club member Tom Tomlinson from Tennessee. It is number 51 of the 138 Factory Built Cars. Bill and Barbara Parfet own this Beautiful Original 1935 851 Auburn Speedster. 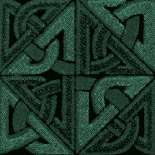 They are also members of the ACD Club.